When things collect in piles, it's a sign you've got stuff that needs a home. You probably aren’t going to move to a bigger house, so you've got to create homes for this stuff in your existing space. That's when you want to start organizing with hooks, and it’s not as difficult as you think. The only alternative is letting go of stuff you've collected and really aren't using. Yes, we're all guilty of this in our “consumer driven” economy where the primary message is buy more. So here are my some of my favorite hooks and how I use them to give everything in my house a home. My favorite hook is a simple (less than $10 at Lowe’s) metal bar with six hooks. It’s simple, white and fits on the back of most doors … and some doors get two of them. Seriously, this is my third house using these hooks. I use the hooks on the back of every closet and bathroom door. We also use them in some of our bedrooms and they're been a lifesaver in my home office. So we're taking a tour around my house, so I can show you were all my hooks are, and what I'm keeping on the hooks. What’s most important, and hard to put into words, is how I now enjoy picking out a scarf where before it was a pain to rummage through a drawer. The content below may have been sponsored and/or may contain referral links. Click to read disclosure policy for more info. Clothes I want to wear more than once, before washing them — pajamas, pants, shirts only worn for a few hours and clothes for messy work like painting and gardening. A pole where you add hooks at any height (from IKEA.) I use this pole for all my scarfs which is perfect because I can move the hooks left and right. In my last bedroom closet, I added hooks (about 20 of them) to a collage picture frames. Then I was able to hang all my necklaces in one place, and smile at my kids photos while I got dressed each morning. Towels on the back of the door or single hooks on the wall for color coordinated towels. Bathrobes for family members or guests. Bathtub toy bags so you can hide them behind the door and only get them out when you need them, which is especially helpful with grandkids. Hooks are perfect for hanging bags on the door in my home office, I’ve got bags for networking meetings. There are bigger bags for carrying my camera gear, so I only have to take the size I need for a short photo shoot, all the way up to a backpack for a long weekend. There are so many different ways to use hooks in a home office, that we're going to add a full page on this topic. For now the best resource for you would be Pinterest, starting with our home office board or organizing with hooks. Doors into/out of your house get a lot of traffic, and many of them don't have a nearby closet for coats. 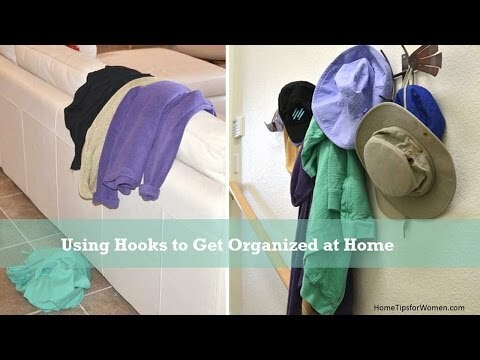 Having hooks near the door helps the kids hang things up when they get home, and helps them get out of the house in the morning, with a minimum of drama. Here's what I keep near my doors, and this list will vary depending on where you live (snow country, close to the beach, etc) and who uses the door like kids who need to hang up their backpacks. Getting & Staying Organized a Challenge?